Francesco Clemente Giuseppe Sparanero (born 23 November 1941), better known by his stage name Franco Nero, is an Italian actor. He is best known for his breakthrough role as the title character in Sergio Corbucci's Spaghetti Western film Django (1966), a role that he reprised in Nello Rossati's Django Strikes Again (1987). Since then, he has performed over 200 leading and supporting roles in a wide variety of films and television programmes in both Italy and abroad, in genres ranging from poliziotteschi, to action, to drama, to war, and musicals. These include The Bible: In the Beginning... (1966), Camelot (1967), The Day of the Owl (1968), The Mercenary (1968), Battle of Neretva (1969), Tristana (1970), Compañeros (1970), Confessions of a Police Captain (1971), Keoma (1976), Hitch-Hike (1977), Force 10 from Navarone (1978), Enter the Ninja (1981), Die Hard 2 (1990), Letters to Juliet (2010) and John Wick: Chapter 2 (2017). He also played the narrator in the film Rasputin (2010), directed by Louis Nero, and voiced the character of Uncle Topolino in the animated film Cars 2 (2011) directed by John Lasseter and co-directed by Brad Lewis. In 2012, Nero made a cameo appearance in Quentin Tarantino's Django Unchained. Francesco Clemente Giuseppe Sparanero was born in San Prospero Parmense (province of Parma, Emilia-Romagna), the son of a commissioned officer in the Carabinieri, originally from San Severo. He grew up in Bedonia and in Milan. He studied briefly at the Economy and Trade faculty of the local university, before leaving to study at the Piccolo Teatro di Milano. Nero's first film role was a small part in Pelle viva (1962), and he had his first lead role in Sergio Corbucci's Django (1966) a spaghetti western and one of his best-known films. In 1966 from Django he went on to appear in eight more films released that year including Texas, Adios (1966) and Massacre Time. In 1967, he appeared in Camelot as Lancelot, where he met his longtime romantic partner, and later on in life his wife, Vanessa Redgrave. Following this he appeared in the mafia film Il giorno della civetta opposite Claudia Cardinale released in 1968. A lack of proficiency in English tended to limit these roles, although he also appeared in other English-language films including The Virgin and the Gypsy (1970), Force 10 from Navarone (1978), Enter the Ninja (1981) and Die Hard 2 (1990). Although often typecast in films like Los amigos (1973) or Keoma (1976) he has attempted an impressive range of characters, such as Abel in John Huston's epic The Bible: In The Beginning (1966), the humiliated engineer out for revenge in Street Law, the gay lieutenant in Querelle (1982) and Serbian mediaeval hero in The Falcon (1983). He has appeared in over 150 films, and has written, produced and starred in one: Jonathan degli orsi (1993). More recently, he starred in Hungarian director Koltay Gábor [hu]'s Honfoglalás (Conquest) in 1996, in Li chiamarono... briganti! (1999) by Pasquale Squitieri and subsequently in Koltay's Sacra Corona (Holy Crown) in 2001. In 2009 he played an eccentric author called "Mario Puzzo" in Mord ist mein Geschäft, Liebling ("Murder is my trade, darling", Italian title "Tesoro, sono un killer"). German critics found his performance was the best part of the film: "Having Franco Nero playing in this film is really a great joy - it is only regrettable that after his appearances there is still so much film left." In 2010, Nero appeared in the film Letters to Juliet with Redgrave. In 2011 he appeared as a guest star on the season 13 premiere episode of Law and Order SVU. His character, although Italian, was based on Dominique Strauss-Kahn. In the same year, he received a star on the Italian Walk of Fame in Toronto, Ontario, Canada. In 2012, Nero made a cameo appearance in the film Django Unchained in one scene alongside Jamie Foxx, who stars as Django Freeman in the film. In the scene Nero plays the original Django, an Italian Mandingo Fighter manager. Nero's Django then questions Foxx's Django about how his name is spelled, and asks him to spell it, referencing a scene from Nero's role as Django in the original Django film. Upon learning that their names are spelled the same way, Nero's Django says "I know" to Foxx's Django. In 2016 and 2017 he has interpreted Gabriele Tinti's poetry giving voice to the masterpieces in the National Roman Museum. His romantic involvement with British actress Vanessa Redgrave began in 1966 when they met on the set of Camelot. In 1969, they had a son, Carlo Gabriel Redgrave Sparanero (known professionally as Carlo Gabriel Nero), a screenwriter and director. After separating for many years, during which they both had relationships with other people, they reunited and married on 31 December 2006. Carlo Nero directed Redgrave in the cinematic adaptation of Wallace Shawn's play The Fever. Nero dated actresses Catherine Deneuve, Goldie Hawn and Ursula Andress in the 1970s. In December 1987, a 26-year-old Colombian woman named Mauricia Mena filed a paternity suit against Nero claiming the actor was the father of her three-week old son. Nero admitted being friends with Mena, a cook with the family where he was staying in Cartagena while filming Django Strikes Again, but denied they had a sexual relationship. Nero walked his future stepdaughter Natasha Richardson (now deceased, 1963 to 2009), down the aisle when she married actor Liam Neeson in 1994. Her father, Tony Richardson, had died in 1991. ^ Ann Pearce. "He Lost His Guenevere, Vanessa Redgrave, but Franco Nero Found His Camelot Back in Italy". People. ^ Redazione online (5 December 2011). "San Severo, cittadinanza a Franco Nero". Corriere del Mezzogiorno. Retrieved 17 April 2013. ^ Paolo Russo (16 November 2014). ""Io, Django e Fassbinder" Franco Nero, che grande attore". La Repubblica. Retrieved 6 July 2016. 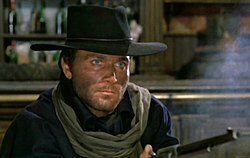 ^ "Dass Franco Nero in diesem Film mitspielt, macht wirklich großen Spaß – schade nur, dass nach seinen Auftritten noch so viel Film übrig ist." Oliver Baumgarten. "Mord ist mein Geschäft, liebling". Filmzentrale. Retrieved 25 November 2011. ^ Yuen, Jenny (5 September 2011). "Italian Walk of Fame honours stars". ^ System. "Franco Nero legge 'Il Pugile' di Gabriele Tinti". www.beniculturali.it. ^ "Franco Nero Reads 'Songs Of Stone' By Gabriele Tinti". ^ "Vanessa Redgrave speaks about marriage to second 'husband' for the first time". Telegraph. 11 June 2010. Retrieved 18 August 2011. ^ "Jack O'Brian's Mainland". Honolulu Star-Bulletin. Honolulu, Hawaii. February 11, 1970. p. 49. ^ Page Six (9 January 1986). Kiss & Tell. New Straits Times. Wikimedia Commons has media related to Franco Nero.